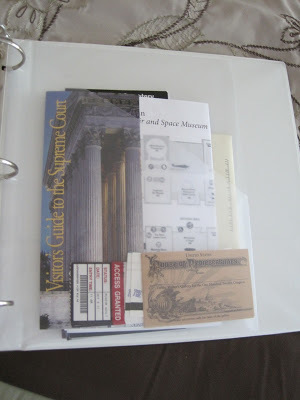 When we began homeschooling, I knew I would need a way to file graded papers and other documents and records. Rather than setting up a plan immediately, I waited a month or two so that I could determine what I really needed. Remembering how well my recipe binder worked, I decided to do something similar. I got a two-inch binder and a set of tabbed dividers for each child. (I also purchased a three-hole-punch as I didn’t have one.) I created sections in the binder for each subject that the girls cover in school. Behind the tab, I filed each quiz, test, etc., for that particular class. When our daughters complete special projects, such as the mammal poster our fifth-grader recently made, I can take a photo of it, then print it, and add it to the binder. 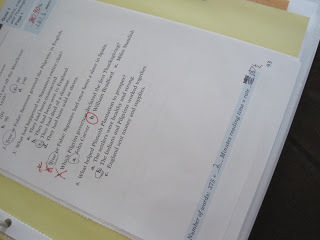 My fifth-grader has one set of quizzes that are printed on smaller sheets of paper. I simply slide all of these into one page protector which is added to the correct subject area. I also bought a package of special pockets to record our field trips. I can save pamphlets, ticket stubs, photos, and other memorabilia from each trip that we take and store each set in its own pocket. While I’m still working on organizing other aspects of homeschooling, at least I feel in complete “teacher mode” now with my binders! 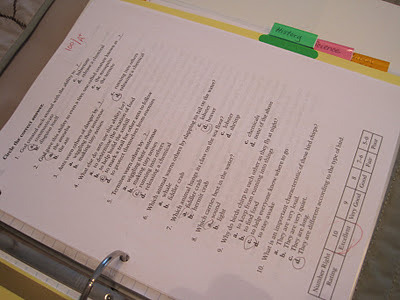 How do you organize your children’s school work or other papers that you need to manage? That's a great idea! I'll have to remember it for next year. This year, so far, we haven't generated too many papers, and I'm just using a three-pronged folder. When that fills up, though, I may have to resort to a notebook. I think I have an empty one in storage…. Looks like you have a wonderful organization system!! Great job! Yes, binders are a must for us too. I have a portfolio for each child, showcasing their best work from each subject, and we also keep field trip memorabilia in there as well. Then I have an administrative binder for each child to house all the attendance, hours log, lesson plans, etc. Currently, I have quizzes and tests in separate folders for each subject, but I really like what you've done! Considering that for the future! 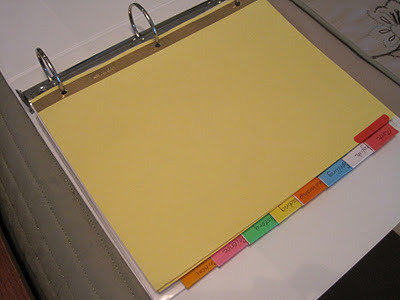 I really try to be organized, but this is something I'm continually working on to see what is best. I'm also considering putting a simple record either online or on a CD, like an excel document with their scores in each subject or a report card type document. Maybe also a typewritten progress statement in each subject. I just got to thinking what if our house went all up in smoke one day or if we were flooded or something of that nature, what would I have to show for our homeschool records? That thought scared me a bit, but I know there are easy ways to remedy that if I just keep some sort of nonpaper records also. Still thinking about the best way to do this. Anyway, sorry this comment is so long! I'm behind already organizing my DD's papers. I need to get on the ball before it gets out of hand.